NOTICE: The Fuzzy Boundaries project completed in March 2010, and the name Junction Triangle was chosen. Please visit www.junctiontriangle.ca for ongoing community discussions. Welcome to fuzzyboundaries.ca. We are a small but growing community group hoping to find a name for our west Toronto neighbourhood. 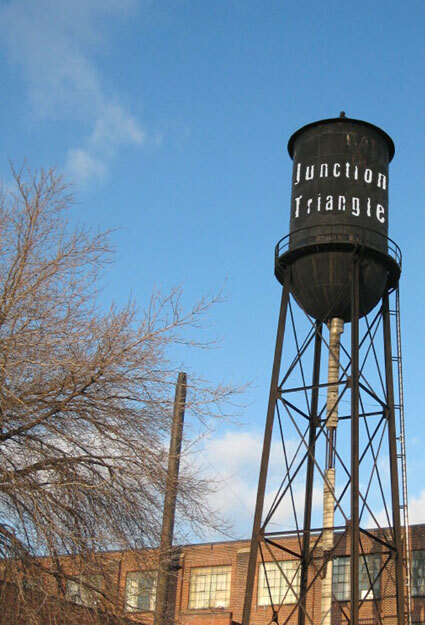 This photo of the former General Electric water tower on Wallace Ave. shows one of our neighbourhood's best-known features, as well as the most popular name, Junction Triangle, as chosen by our residents in the second and final round of voting. A number of different names have been used since Shedden Farms became a neighbourhood in 1887. More than a year ago, some local residents formed a group called Fuzzy Boundaries to initiate a naming process for the area. Our mission was not to name the neighbourhood ourselves, but to inspire the community to choose a name. Whether people were new to the community, seasoned residents, or somewhere in between, they were encouraged to take part. March 16: Final results are now posted! Fuzzy Parade - Sunday, March 14, 2010 at 1 p.m.
Voting complete! Results on Tuesday. Comments now closed - please vote!